View and search this newspaper by clicking on the Chronicling America link below. This newspaper comes from the collections of the Kansas Historical Society and was digitized with funds from the National Endowment for the Humanities as part of the National Digital Newspaper Program. The first issue of the Thomas County Cat was published in Colby, Kansas, on March 12, 1885. It was the first newspaper in Thomas County, which was not officially organized until October 8, 1885. 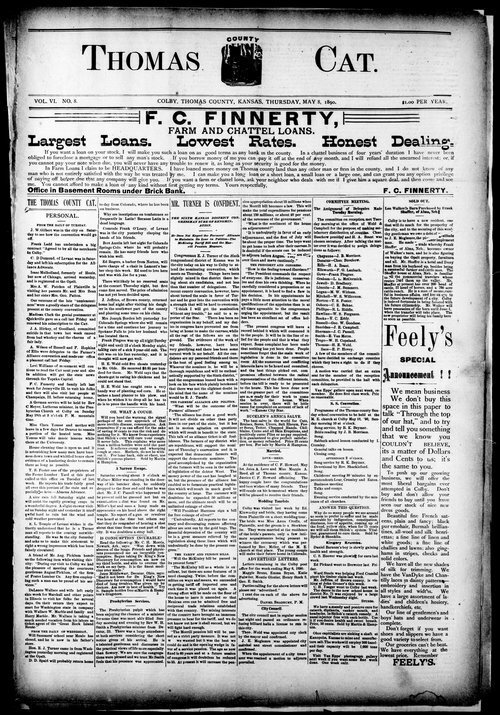 "The Cat" maintained a six-column folio format, published weekly on Thursdays. During its short six-year tenure, the paper had at least nine known editors and publishers. In February 1891, the Cat was absorbed by the Colby Tribune.